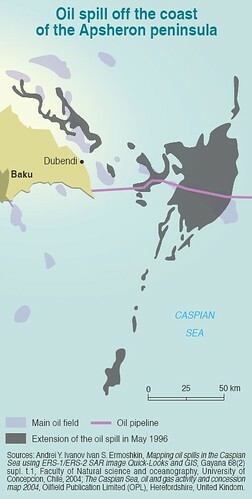 Thousands of hectares of soil on Azerbaijan’s Apsheron peninsula are unsuitable for agricultural use due to oil spills. The largest of these oil spills happened in May 1996. Oil extraction is happening off shore, in the Caspian Sea, and the oil is transported by pipelines.